GM - Of the three reports we sent out this past week SNAP is by far my favorite, and I do own the stock. 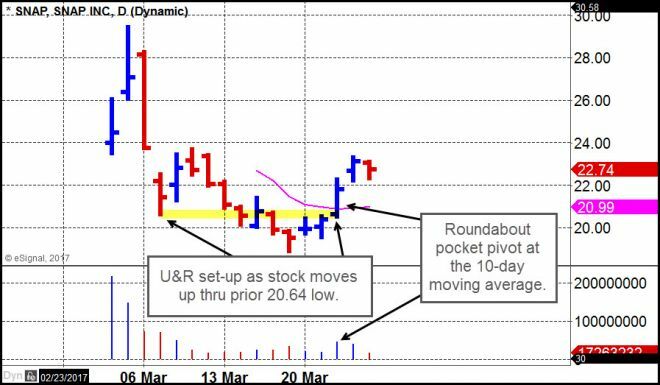 I, however, bought it on the undercut & rally (U&R) move, also known as Wyckoff's Spring when the stock moved up through the prior 20.64 low in the pattern early Wednesday morning. 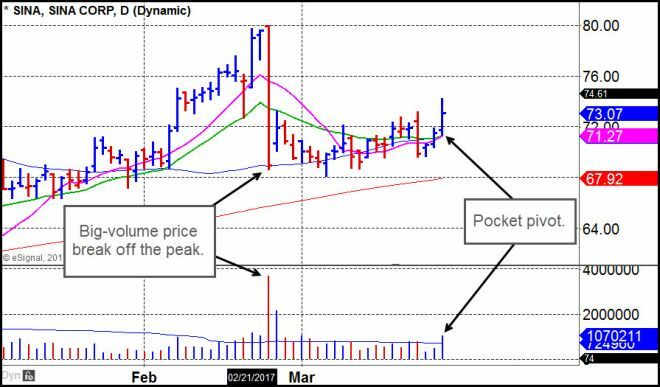 This results in a clean pocket pivot up though the 10-day moving average in roundabout fashion. Watch for this to hold tight here, which could give the 10-dma time to catch up to the stock as a possible late entry for those who did not act on either the initial U&R set-up or the immediately ensuing pocket pivot. Dr. K - SNAP illustrates two of our entry point strategies at work: the Wyckoff undercut & rally on 3/21 which was then followed by the pocket pivot the day after. If SNAP remains viable, it may consolidate its gains here on low volume, thus may turn into a "voodoo" type set-up as its 10-day line catches up to its price. GM - MKSI is interesting in that it actually failed on a breakout attempt earlier in the week, but showed strong supporting volume the very next day in a pocket pivot move off of the 50-dma. The stock is now trying to hold the 20-dema, but selling volume picked up on Friday. If interested in this stock, I would suggest looking to buy at the 50-dma in more opportunistic fashion. Dr. K - While group strength is ranked #1 and fundamentals remain very strong, the stock can be a slower mover which tends to get support around its 50-day. Buying closer to the 50-dma thus reduces one's risk. GM - SINA could be setting up in what we like to cal a "LUie" formation, where a stock shows some sharp weakness but then holds tight in an "L" formation along a key moving average, in this case the 10-dma, 20-dema and 50-dma. The tight action then results in the "L" pattern turning into a "U" as the stock turns back up to the highs, hence the term "LUie" formation. 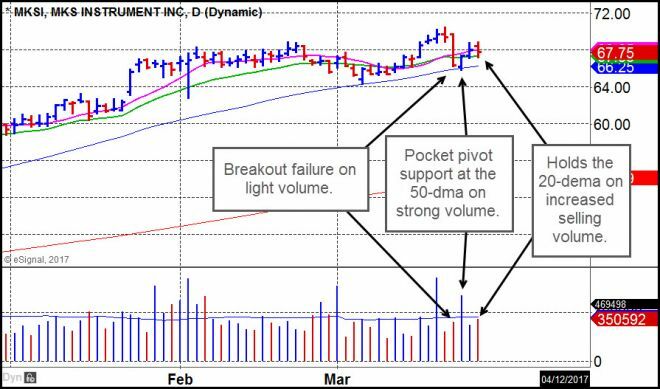 This pocket pivot looks interesting, and entering as close to the moving averages as possible while using them as a tight selling guide is your best approach here, in my view. Dr. K - The confluence of three moving averages is often a sign of strength in the pattern. If the price dropped below all three moving averages to around 71, that could be a logical sell stop, or a risk of about 2.7%.